I noticed you didn't have any Missouri castles listed. I know of at least two in Missouri. 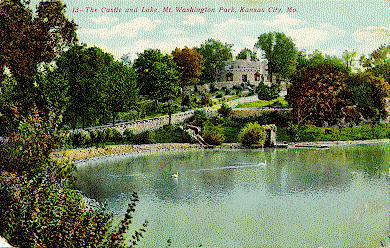 There is a castle in the Kansas City Area, near Independence. It's small, but nevertheless, a castle. I don't have much info for you but this is what I do know. The Castle in Independence I believe they are talking about is located on Truman Road close to the cross street of Blue Ridge. It's address is 8600 Truman Rd. It is called the WEBB CASTLE and was built in 1904. The shell is all that remains of the castle now. Because of its gloomy appearance and its location opposite the Mount Washington Cemetery, the castle was rumored to be haunted, and the legend persisted that those disturbing the ghosts would be doomed. Back in the late 70's and early 80's I had a chance to visit the castle as they where using it as a haunted house to raise money around the halloween seasons. On pages 202 and 203 of a book called "Kansas City Style - A social and cultural history of Kansas City as seen through its lost architecure" is where most of my information came from. This book has more information and if it will help my copy was the Third printing: September, 1992 Dory DeAngelo and Jane Fifield Flynn Fifield Publishing Co. ISBN Number 0-9633758-1-4. Fifield Publishing Company P.O. Box 30302, Kansas City, Mo. 64112. The book was presented by The Law offices of Shook, Hardy & Bacon. There is a picture in the book supplied by the Jackson County Historical Society. The article talks about hidden passages and it was used as a tavern during prohibition in the 20's, it was also a base for smugglers supplying liquor to area speakeasies. I havent driven by the castle in a few years but I'm sure it's pretty run down. Webb castle in Independence on Truman road is now completely gone. They tore it down. For years it use to be used as a haunted house. People pay and go in to be scared. I think it happened a couple of years ago. But it is gone. Too bad because it was really neat. I know a little about the castle you call Webb Castle. I was born in Independence and have lived there most of my life, almost 52 years.The castle was a German castle and was bought by an American and taken apart and numbered and restored in Independence across from Mt. Washington Cemetery. In the early 60's it was used as a haunted house. I did go into it and it had mostly all round rooms. It also has a beautiful carriage house which later burned down due to vandals. It was just recently completely torn down and removed. When you were traveling east on Truman Road and came over the hill down towards the cemetery the castle was nestled in the middle of a small forest area to the right. It was a wonderful sight and i am really sad that it was removed. I remember this castle. Me and my mom went through it when I was a little girl. It was in very bad condition. All I remember is when you walked in the front door, you were immediately invited to go up stairs. The stair case was on each side of the front door. Thus, when you walk up one side, you would go around the "main turret" like an inside balcony and come down the other side. Along this balcony were other rooms which you could walk into. They, too, were round. Even the space in the basement which kept the boiler (rusted to almost nothing) was also round. So sad that the people who owned it during the "haunted house" days used the money for their club (I think it was the JC wives club???) instead of restoring to a bed and breakfast or even a tiny museum. Even though the castle is gone the property remains unhabited and they've blocked off the remaining driveway. If anyone is doing research on this property, The Independence Examiner (newspaper) has a couple of articles complete with pictures. Anybody winning the lottery want to build a duplicate??? I passed this castle very often as a child and up into adulthood. In the middle 70's I had the chance to enter this castle while it was being used as a haunted house by the Boy Scouts. I don't know anything about it being used as a private club. To my recollection apart from the occasional use as a haunted house by one group or another I do not remember it being anything but a vacant building. I have lived near this castle the majority of my life and also miss seeing it amongst the trees. It is indeed gone now. The drive way up to where it was is barracaded off with large stone blocks. The pond is still there. The woods are still there. It is located on the south side of Truman Road across from Mt. Washington Cemetary just east of the Blue Ridge Road bridge. There are a few businesses near it and it is in a residentual neighborhood. The land is now inhabited by a few deer and small animal life. There are rumors of the land being haunted. I still live within a few blocks of this piece of land and pass it on a daily basis. 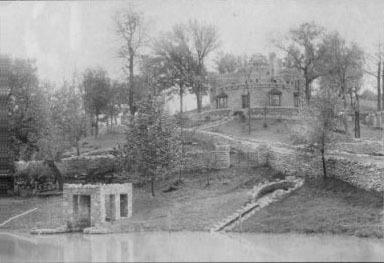 The Webb Castle that used to be on Truman Road in Independence MO was moved here from England in 1904. My grandmother used to go over and play with their little girl in the 1930's. I just thought I would forward this photo I found of webb castle. Thanks to Katrina Price for finding the first photo.